In a small Alabama town in Zion County, life is finally looking up for 20-year-old Donnette Sullivan. Having just inherited her aunt's old house and beauty shop, she's taken over the business, and her husband Tim, recently crippled in an accident, is beginning to cope not just with his disabilities but also with the loss of his dreams. Once a promising artist who gave up art for sports, Tim paints a sign for Donnette's shop, Making Waves. The raising of the sign causes ripples through the town. In a sequence of events, sometimes funny, sometimes tragic, leading up to the surprise denouement, the lives of Donnette, Tim, and others in their small circle of family and friends are unavoidably affected. 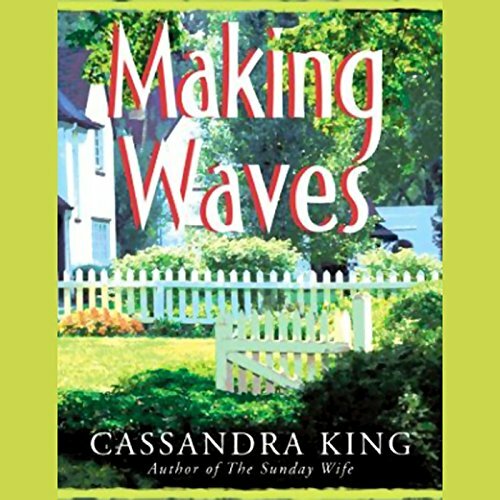 ©2004 Cassandra King (P)2004 Listen and Live Audio, Inc.